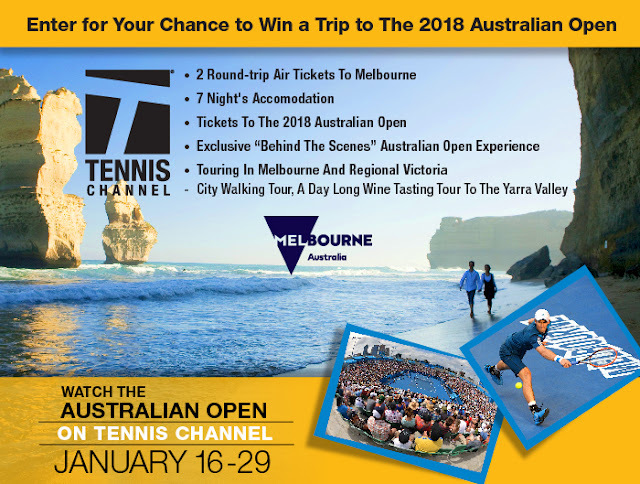 The Tennis Channel has your chance to enter once to win a vacation for two to attend the 2018 Australian Open tennis match in Melbourne worth about $10,000! One (1) Nationwide Winner will receive a trip for two (2) to the 2018 Australian Open. The Trip Package includes roundtrip airfare with connections, economy class, for two (2) between a major gateway airport near winner’s residence and Melbourne, Australia; seven (7) consecutive nights’ hotel accommodations at a hotel selected by Prize Provider in its sole discretion (one standard room, double occupancy); two (2) tickets to the 2018 Australian Open; two (2) tickets for a behind the scenes Australian Open Experience; and a Melbourne/Regional Victoria city walking tour for two (2). Winner and guest must travel on the same itinerary. Prize components may not be separated. The total approximate retail value of the Trip Package will not exceed $10,000, and is subject to change based on winner’s location and airfare at time of booking. This Sweepstakes ends on 01/20/17 and you can ENTER ONCE to win.